Really, what’s not to love? They are, with a few exceptions, easy to prepare, they can be made up in advance, and they are comforting. 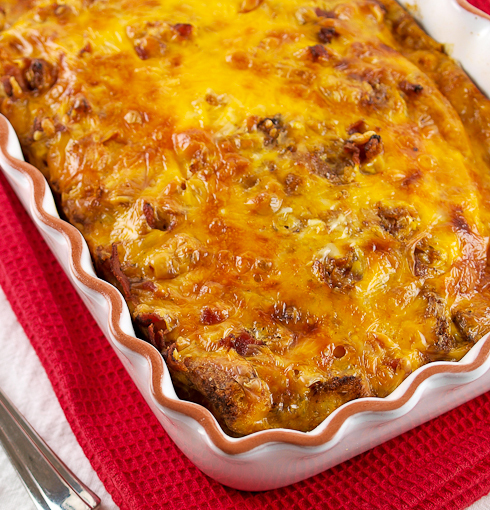 When the weather turns chilly there is nothing I like better than a cozy casserole. So, one morning a few days ago it was just a little chilly. Not co but the wind had a little bite. Obviously it was time to make a casserole! 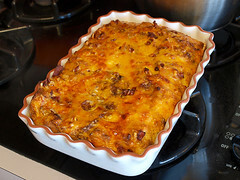 While perusing a casserole cookbook, sponsored by one of those canned soup companies that shall remain nameless, I came across a casserole that had potential. 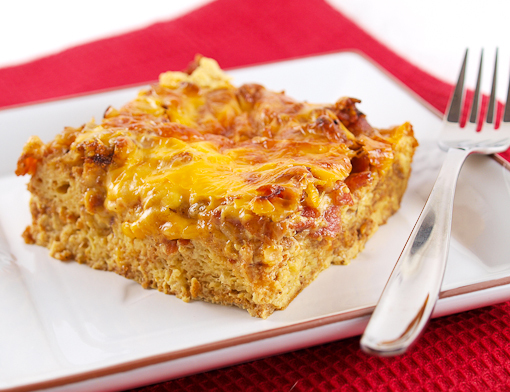 It was made with a box of croutons, a can of cheese soup, eggs, and bacon. It sounds disgusting on its face, but I saw past the over-processed ingredients into the heart of the recipe. It was begging to be made with fresh ingredients, and who was I to walk away from that kind of challenge? So, I came up with this. I started with whole grain bread that was a little past its prime. It was edible, with a pleasant nutty flavor, but it was no good for the sandwiches and toast I had purchased it for. 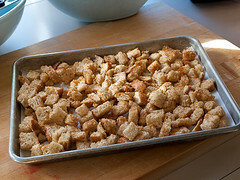 With it I made some buttery homemade croutons, which are so easy I can’t figure out why people buy them. Next, I fried some bacon until it was quite crisp, and with the bacon drippings I sauteed some onion and garlic. Those flavors would have been in the store bought croutons, but I opted for fresh. Finally I made a basic custard base of eggs and milk, and I shredded some cheese. Rather than a cheese sauce I wanted my casserole to have a lightly browned cheesy top. 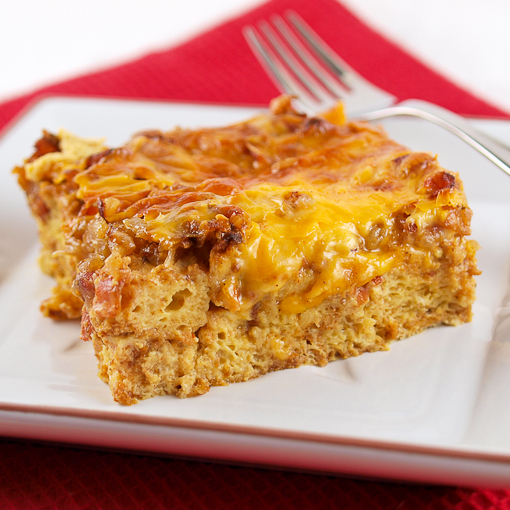 This would make a great addition to a brunch menu, particularly around the holidays, but it would also make a great dinner. You could also prepare this whole thing the evening before and just bake it off in the morning. I think I did right by that poor little casserole, and I know I did right by me. I enjoyed every bite! 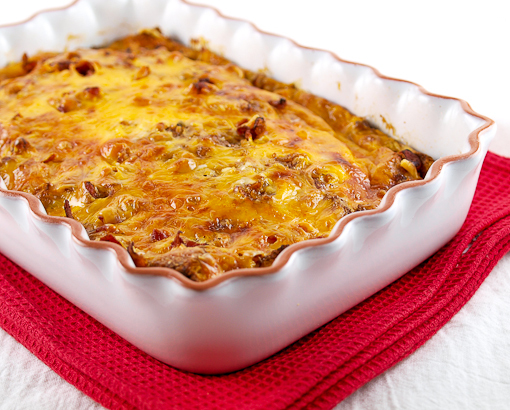 Heat the oven to 350 F and spray a medium casserole dish with non-stick cooking spray. 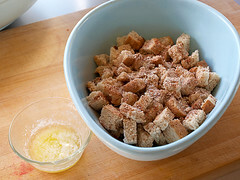 In a medium bowl combine the bread, melted butter, paprika, salt, and pepper until the bread is evenly coated. 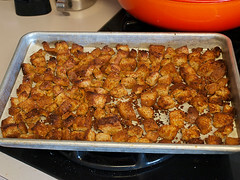 Spread the bread on a baking sheet and bake for 12 to 18 minutes, or until deeply golden brown and crunchy. Set aside to cool. 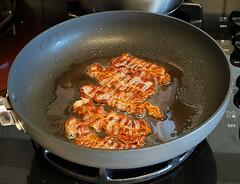 In a medium skillet cook the bacon over medium heat until it is very crisp. 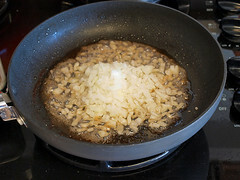 Remove the bacon from the pan to drain then add the onion and garlic and cook until just softened, about two minutes. Drain the onion mixture well on paper towels. In a medium bowl whisk together the eggs, milk, and hot sauce until well combined. 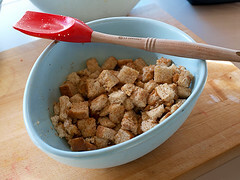 To assemble first spread the bread chunks on the bottom of the prepared casserole dish. 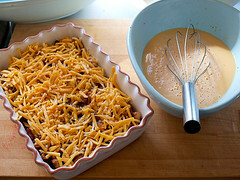 Next spread over the onions, then crumble the bacon and spread it in an even layer. Top this with the cheese then carefully pour over the egg mixture. Let stand on the counter for 10 minutes, or cover and refrigerate overnight. 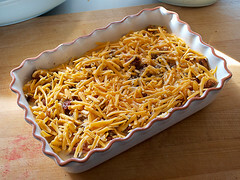 Bake for 35 to 45 minutes, or until the casserole is puffed all over and the cheese is golden brown. Cool for 10 minutes before serving.